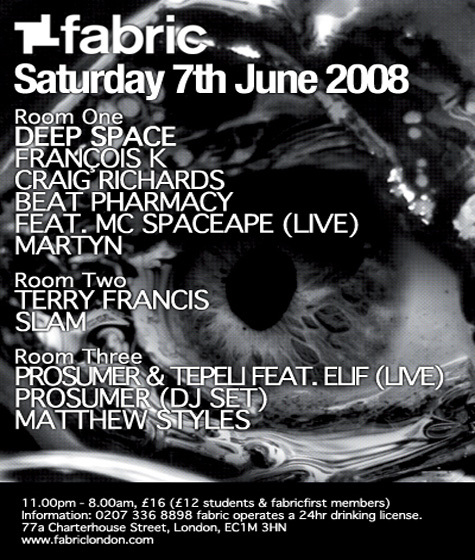 This Saturday, June 7th, Francois K and Brendon Moeller are packing their gear into the spaceship to bring NYC’s Deep Space night to London club extraordinaire, Fabric. Moeller (as Beat Pharmacy) will be performing with MC Spaceape in anticipation of his forthcoming dub protest album. And if that wasn’t enough, Prosumer, Murat Tepeli and their muse, Elif will be performing live in room three, with DJ sets from Prosumer and Matthew Styles. If you would like a pair of tickets to this jam packed event, all you need to do is be the first to correctly answer a trivia question: What label put out Francois K’s first release? Email your answers to editor(at)littlewhiteearbuds.com by midnight (CST), Friday the 6th. The stumped should check discogs.com for more information. Good luck!